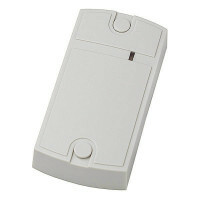 Matrix II Net network controller is designed for using in the online and offline access control systems. It's designed for managemanet of the electromagnetic and electromechanical locks, turnstiles (2 x Matrix II Net controllers required). The controller provides power control functionality. Matrix II Net controller is easy to install and maintain. There is a possibility to connect Matrix II Net controller to the PC via USB or Ethernet/Internet network using Z-397 Guard USB/RS-485 (Z-397 Guard USB/RS-485/RS-422) or Z-397 Web converters respectively. This makes it possible to build a complete network access control system with a time tracking, event control and report building based on the software solutions. Matrix II Net controller allows you to connect 2 readers, reader and exit button, electromagnetic or electromechanical lock, external buzzer, external LED, door opening sensor.